Stretchers are not usually something you want to pass on a hike. Up here they have ones made with a steel frame and a single centered spoked wheel like one on a heavy mountain bike. Halfway up to Kibo huts they were rolling down a man wrapped in a sleeping bag and cargo straps. There was a porter on each end on one on each side and the man, one of the Chinese bankers I had met the day before, was apparently unconscious. I heard later he had not had a serious crisis like a heart attack, but instead was suffering from acute altitude sickness. Still, watching an evacuation is disconcerting, though clearly the trekking companies are prepared for it. For some reason it reminded me of the search for “Inchworm” on the Appalachian Trail in 2013. An older woman hiker had not reported in when expected, so a full scale hunt was instituted. My son Bennett and I happened to be hiking in that part of Maine that summer and met a number of the search teams, very professional operation though they didn’t find her (her remains were discovered in 2015). Of course they were not carting off anyone’s remains up here today–just a rescue operation. The change in altitude brought another change in foliage. Lower down, where there were still streams, there were many more of those dr. Seuss trees, which Gideon called Giant Senecio. He said they grew where there was running water, but also only grew very slowly. After we got over 4300m it turned to high desert with a lot of red volcanic rock. One part crossed a dusty plain that looked very much like part of New Zealand’s Tongariro Crossing. 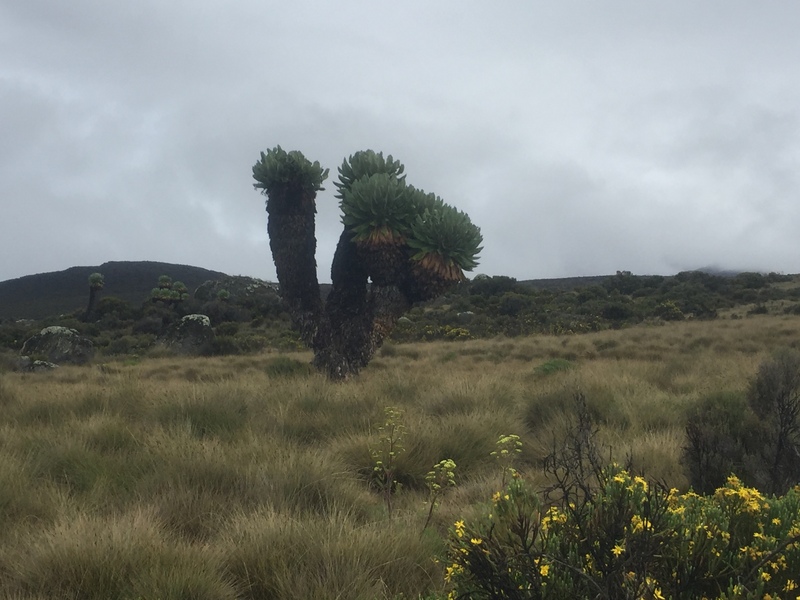 The ascent was gradual and the path smooth, so we arrived at the Kibo huts by noon. The last hour it rained hard, so we arrived soaked. An English woman named Anna is also planning to summit tomorrow and her porter, Abu, is good friends with Gideon, so we have decided to join forces for the climb. For now, we are to try to sleep as much as we can this afternoon and early evening as the hike commences at midnight.